Hours of Operation: 8 am to 6 pm. Other times available by special arrangement. I have resided in Kingston for the past 26 years, so I truly think of Kingston as my home now. I enjoy working with people, as I recently retired from the TD Bank after a 35 year career. Customer service, therefore, has always been a specialty of mine. I grew up in Ottawa in an ‘extended family.’ Our grandparents lived with us and helped raise four grandchildren. They were influential in ensuring I was respectful and caring towards my elders. In my early highschool years, I worked as a volunteer on weekends at the Rideau Regional Hospital School for children with disabilities. Then I worked as a nurse’s aide in later highschool, at Medex Nursing Home. I developed a good understanding of the nature, needs and idiosyncracies of seniors, and came to love and appreciate seniors even more. 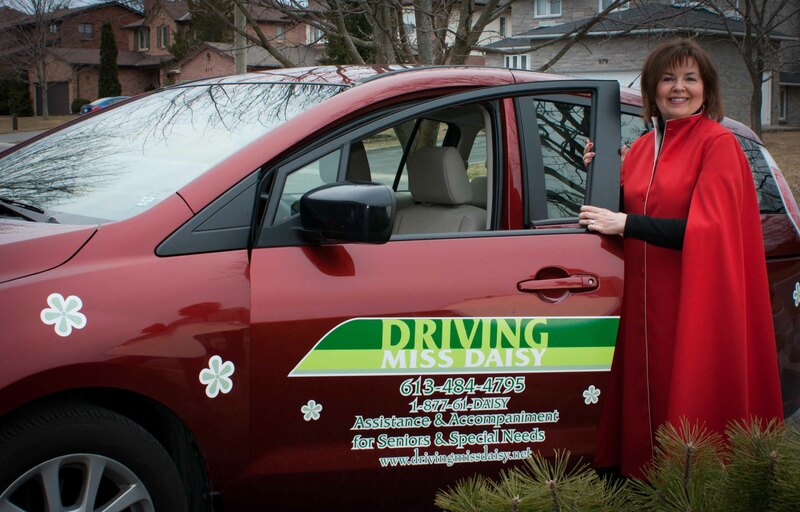 I love my Driving Miss Daisy business. We don’t just journey from A to B. My clients have such wonderful stories to impart. They come from different cultures and countries from all over the world. We discuss family issues, health concerns, gardening, cooking shows, books they are currently reading, and of course, I help them make sense of their banking world. Sometimes we just go out for tea, or lunch. Basically, we just have fun. We have recently added a fully accessible van to our fleet. We can also accommodate collapsible wheelchairs and walkers in our other two Daisymobiles. Evenings, weekends, and Airport Service (to Ottawa, Toronto and Montreal), by special request. I look forward to serving you. To schedule an appointment please call me at (613) 484-4795.